Expello Air Products, a unit of D&D Instruments, announces the proven technology of its pneumatic drain valve for air brake systems is now available in a kit for use in repair facilities that use compressed air. 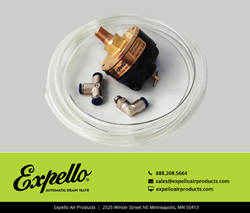 The Expello Shop Drain Valve provides long lasting, durable air system protection. It expels contaminants from air tanks with a powerful blast of air whenever the compressor reaches cut-in and cut-out. A proven corrosion resistant construction, the Expello Shop Drain Valve ensures maintenance-free protection over the long haul. Its self-cleaning, blow-through design provides cleaner, drier air without daily draining of the air tank. With contaminants expelled from the air tank, the service life of other air-operated components is extended. The Expello Shop Drain Valve comes with a one year warranty. The highly durable, proven technology is an inexpensive method of extending the service life and minimizing maintenance costs of a repair facility’s air equipment. Learn more about the Expello Shop Drain Valve at http://www.expelloairproducts.com or call 800-766-4243. Expello Air Products is a unity of D&D Instruments. DDI remanufactures instrument clusters for International and IC Bus vehicles produced from 1992 - present. The company also repairs instrument clusters for most other makes and models of medium and heavy duty vehicles, vocational vehicles and buses.